Whether it’s beating the lines of crazy Christmas shoppers at the mall or simply enjoying the convenience of 24/7 retail, every year, more and more customers are looking for Christmas shopping inspiration online. Browser-maker Opera Software presents some really useful tools that turn the December shopping fever into a smarter and more efficient gift hunt. Keeping track of all your pre-Christmas discoveries for everyone on your gift list can be tricky. The Stash feature, recently introduced in Opera, is a handy way to collect snapshots of saved webpages – like gift ideas – all in one place. The Stash feature is accessible from the Speed Dial page and to add a webpage you visit to it, simply click the heart icon in the address bar. It’s like your private pinboard for online inspirations, bringing you a much more intuitive way of comparing. Another new Opera innovation is the Discover feature, a one-stop shop for articles from the location and categories you choose. Gain a lean-back way of discovering Christmas gift ideas, by selecting Culture for books or Technology for the latest gadgets. If you’re buying for a travel buff, look in the Travel category, as there are always articles on top gifts for jetsetters and the like in the lead up to Christmas. What is Christmas without some surprise? Sometimes leaving traces of what you’ve been surfing can give away early the gift ideas you have in mind. 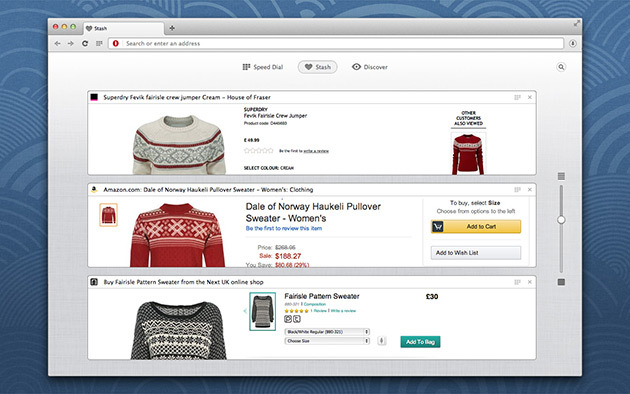 Do your Christmas gift research in secret by using Opera’s private mode. Create a private window by selecting New Private Window from the menu, and surf in stealth. If you spend long hours in your favorite online shop, why not explore it faster and more easily? With the Opera custom search option, it’s easy. Simply go to any online store, right-click (Ctrl-click on Mac) its search field, and select “Create search engine” from the pop-up menu. Then, add a short keyword to be able to use the search engine directly from the address field, such as “A” for Amazon. Once it’s ready, you can type your keyword and the name of the product you’re looking for into the address field, no matter what website you’re currently visiting. Make sure your great gift ideas get real, and use safe online resources. Opera browser is designed with the most widespread security measures available, making shopping more secure. Security badges next to the address field indicate the security of the website. Before you enter any information about yourself, especially credit card details, look for a badge in the website address field containing a padlock symbol, which tells you the website is secure. Download the Opera for Windows or Mac web browser for your computer from http://www.opera.com/.